Advantages: Overview of development and operations; detailed”walk around”. The Macchi C. 202 was, in my opinion, Italy’s first true “modern fighter” of World War Two. With its aerodynamic design, its modern in-line Daimler-Benz engine (license produced), enclosed cockpit and excellent handling characteristics, it was Italy’s attempt to catch up to the Spitfire and Bf 109. But, as this book notes right upfront, the Macchi 202’s failure was typical of the Italian aircraft industry at the time. Insufficient in quantity and armament, and lacking spare parts and engines, the Macchi C. 202‘s fate to be inadequate to the task seemed sealed at creation. This is the second in Mushroom Model Magazine’s Orange series. The Orange series combines the Yellow Series’ focus on aircraft with the Red Series’ focus on history; hence Orange. The layout of the book is in the typical MMM style. There is a brief introduction and a discussion of the development of the aircraft. What is helpful is that the aircraft’s development is approached based on the production series, rather than the serial number. In the Italian aircraft industry, serial numbers were not necessarily sequential with regard to a given production series. 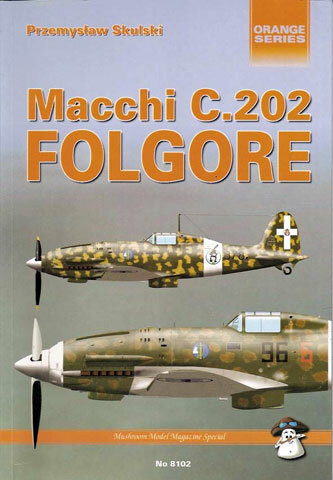 The book gives a brief account of the combat history of the Macchi C. 202 from its introduction into combat during the Spring and Summer of 1941, through its relegation to second line duties with the Regia Aeronatica (Aeronatica Cobelligerante) in the South and the Aeronautica Nazionale Repubblican in the North. This section, as well as the previous one, has a number of well chosen pictures. The photographs of the preserved aircraft are supplemented by a few illustrations from the original technical manual. One question that is often asked on aircraft discussion boards concerns the nature of the openness of the forward portion of the wheel well, exposing the engine to the elements. On page 68 is a drawing of what appears to be the wheel well inserts that were used to enclose the forward portion of the well. It is a shame that the purpose of these objects could not have been pointed out. The final section of the book presents colored profiles for 44 different aircraft. But it appears that a possible printing problem reduced the quality of the profiles. While the use of Verde Mimetico 2 and Verde Oliva Scuro are correctly identified, the printing has rendered them, at least in my copy, a most distinct brown color. Also, while a number of profiles make note of aircraft having typical Macchi or Breda camouflage (the two main producers of the 202), I wish the authors had taken a few words to explain the difference a little more. It was “typical” for Macchi camouflage to have the upper surface colors wrap around the fuselage, while the under surface of the wings and tail planes were in the gray. On Breda built aircraft, the “typical” camouflage meant that the under surface gray extended the length of the fuselage and swept up under the tail planes. Of course there are issues of “smoke rings” and big blotches and little blotches and green or nut-brown base colors. It must be said, however, that this book is not alone in simply saying “Breda style” or “Macchi style”, without further explanation, and the issue of Italian camouflage patterns is beyond the scope of this book. As long as I’m discussing profiles, I’d like to raise the issue of the accuracy of and basis for a profile. In this day of computer programs that allow one to produce aircraft profiles in infinite detail and variety, we are usually left without any independent means to verify the accuracy of a profile. Let me take for example the profile of certain Breda produced 202 that became the personal aircraft, “Black 1”, of Haupt. Joosip Helebrant the commander of 2 / JGr Kro (or 2. / Kro JGr 1). One profile of this aircraft is in the Osprey series, “Croatian Aces of World War 2”, the other is in the MMM book under review. There could not be two more different profiles. As neither book indicates that that there was more than one “Black 1”, I can only presume they are referring to the same aircraft. Also, in neither book is there an actual picture of this aircraft, and I have not been able to locate a picture even with the help of an expert on the Regia Aeronutica / ANR. Finally, in neither book is there a statement to the effect that this is an unverified profile. In the Osprey book, the aircraft is in a dense mottle of Verde Oliva Scuro over a Nocciola Chiaro. It has full Luftwaffe Markings, with a yellow fuselage band and a yellow under-cowl. It is said to have come from the Luftwaffe, Luftpark Nis. In the Mushroom book, the aircraft is presented as in a more defined mottle of green over nut brown with full Croatian makings on the wings and fin, without any yellow markings. The aircraft was reported to have come from the Breda factory. Now it is possible that one is correct, or neither is correct. The Luftwaffe did takeover Italian aircraft and applied full Luftwaffe markings. The Luftwaffe also handed over aircraft to its “allies’. Furthermore, it is known that the Croatian Air Force applied its national markings to foreign aircraft supplied to them, such as the MS. 406 and the Fiat G.50. Who is one to believe in this situation? Do we believe the authors of the Osprey volume because one is an associate of the Yugoslav Aeronautical Museum, and the other is part of the Yugoslav Historical Research Group attached to the Air Force Museum in Belgrade? On its face they do appear to have better credentials. But any acceptance of one over the other has to be a pure leap of faith on one’s part. For the modeler, either set of marking would make for an interesting model. But, for the aviation historian, this can be quite frustrating. I would hope that in the future authors do provide us with more information about those attractive drawings. For those with a casual interest in Italian aircraft, or who want a reference for modeling the Macchi C. 202, this is a fine book and I recommend it to them. For those who are looking for more depth and detail, this volume may fall short of your needs. One final note; I believe the book contains a bit of unintentional revisionist history. If, as stated on page 25, Mussolini did surrender on 8 September1943, then whom did General Student have rescued from Gran Sasso prison and whom did the partisans string up by his heels? An interesting premise to an alternative history.